The new challenge is live at The Stamp Man and for this fortnight Lisa has challenged us to use white and one other colour. Don't ask me how I settled on green, I have no idea, it just happened - so like me I know. My TH stamps have come out again with DIs and a white gel pen. I also played with marbling using alcohol inks. 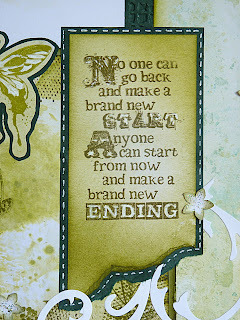 I hope you will pop over to the Stamp Man challenge blog and take a look at the fabulous inspiration from the team and hopefully enter the challenge. Don't forget Jill kindly donates a £10.00 voucher to the winner who is chosen by the DT and if you take a look at the on-line shop there is free P&P over £20.00. Such a good deal. Well it's the end of my first full week back at work and it is so strange being a head again after four years doing other things. It is lovely to have my own school and to have a group of staff and children that you see every day, to build relationships and get to know well. It's very different to my last school where there were nearly 400 hundred pupils - here there are less than 90. Let's see how it goes next week. Take care and have a good weekend.. Stamp Something - Anything Goes - Last challenge good luck ladies and thanks. I Brake For Challenges - Backgrounds - I have different textures and techniques to the pieces that make up my background. Nice and elegant, Brenda. The green is rather peaceful. So glad you are enjoying your new job. Nicley done Brenda :) love the colour green. Love your monochromatic green! The embossed panel and the gel pen stitching really pop! Beautiful! Hope your next week goes well and enjoy the weekend! Hugs! A gorgeous creation Brenda and I love the green choice and the fabulous text on there. Didn't realise you were a Headteacher so many congratulations on that. The small number must be lovely as it gives you more of a chance to get to know everyone there. You take care and have a good weekend too. Great card and I love the marbling! Wow this is gorgeous Brenda! I love greens and also monochromatic designs so this is right up my street! Beautiful effects with the Distress Inks! Love it! Glad you are liking new school. Great card, thank you for joining in at the Muses this week. Love the greens! I have been meaning to buy this stamp set! I love it. Great details and design! What a gorgeous card, my friend!! So many details and wonderful design! Have the colour scheme - greens just seem to be so right sometimes, as this is, and others don't weem to work. I've just been reading about all your new and axciting projects. It sounds like life is certainly a full one for you. I hope you enjoy every minute. Good Luck with it all. I always look on the DT post every fortnight and always feel so inadequate when I see you projects. They are absolutely stunning and this is no exception. 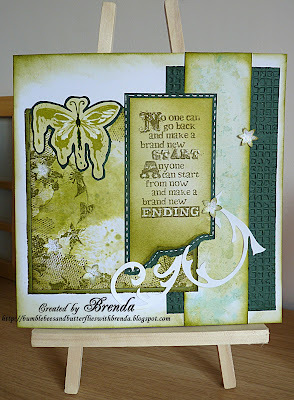 I love the greens and your stamping is amazing. You are one talented lady. A fantastic monocromatic piece, love the saying. Great artwork and good luck at I Brake for Challenges. Fabulous monochromatic piece. 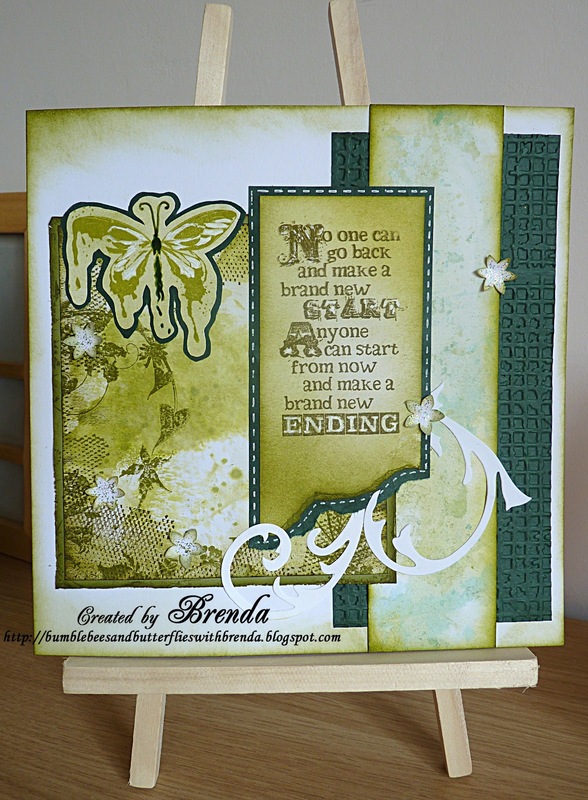 A gorgeous creation Brenda and the green selection on it is great and the fabulous text on there. your little school sounds perfect Brenda. beautiful card i want to add your card to my collection.